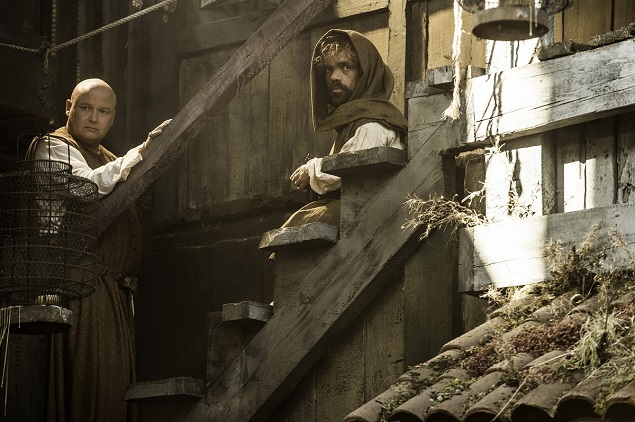 Conleth Hill and Peter Dinklage as Varys and Tyrion Lannister. Photo Credit: Helen Sloan/courtesy of HBO. “The future is sh—t. Just like the past,” Tyrion Lannister (Peter Dinklage) tells fellow fugitive Varys (Conleth Hill), after they’ve crossed the Narrow Sea early on in the season five premiere of Game of Thrones. This statement is very accurate when talking about the fresh hell that is Westeros, but it couldn’t be more wrong about the series itself. The first four seasons of HBO’s medieval fantasy amounted to an epic first act, which presented high quality, dramatic storytelling and so many surprising plot twists and shocking deaths that it’s been hard to keep count of how many times we’ve screamed at the TV. While many other series struggle to keep the second act fresh and exciting, Thrones keeps the ball rolling in its confident, refreshing and oftentimes humorous new season. As most seasons of Thrones have gone, the first four episodes of season five are a slow, yet extremely enjoyable burn. There’s an abundance of setup for the main characters that will leave us craving the remaining episodes all at once, itching for those jaw-dropping moments we’ve come to know all too well. Many characters are thrown into new territory, both emotionally and physically, as the show reinvents itself in more ways than one. What’s most apparent is the season’s confidence in its storytelling — creators David Benioff and D.B. Weiss have already proved themselves with four stellar seasons, and now it seems they’re letting loose and having fun with the narrative gambles they take. None of these risks are more evident than the show’s first use of a flashback. A creepy cold opening presents a pivotal moment in young Cersei Lannister’s life, which provides insight into the often morbid psyche of the Cersei we’ve come to know, played to icy perfection, as always, by Lena Headey. The villainous female monarch takes center stage as a major player thanks to the death of Lannister patriarch Tywin (Charles Dance) at the hands of Tyrion, who Jaime Lannister (Nikolaj Coster-Waldau) released so he could escape execution. Cersei is determined to be the next Tywin and rule in a not-so-behind the scenes manner, since King Tommen, her youngest son, isn’t old or mature enough to wield power wisely. 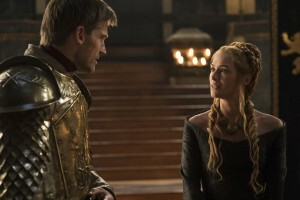 Early on, the most ambitious Lannister’s rash decisions aren’t sitting well with the royal associates left in King’s Landing and her relationship with her son’s new betrothed, the wealthy soon-to-be Queen Margaery Tyrell (Natalie Dormer), is deteriorating faster than Arya Stark’s sword-wielding skills — although, the thinly veiled jabs between the two make for the season’s most entertaining scenes thus far. A still from GOT. Photo: Helen Sloan/courtesy of HBO. Speaking of the fan favorite, Arya (Maisie Williams) is finally not wandering through the Riverlands and has embarked on a new, compelling saga in Braavos. She’s left almost everything from her old life behind, and her new journey poses an endless amount of questions and will leave fans salivating for more. Characters embarking on new journeys in new locations is another major storytelling innovation this season — Arya and Tyrion are both in Essos and Brienne (Gwendoline Christie) and Podrick (Daniel Portman) are searching everywhere for the Stark daughters, while Sansa Stark’s (Sophie Turner) storyline takes a dramatic turn in both location and plot that will leave TV show viewers and readers of George R.R. Martin’s A Song of Ice and Fire novels immensely surprised. In fact, a huge factor that sets this season apart from previous ones is the convergence of storylines that will allow many characters who haven’t met (or seen each other in a long time) to cross paths. With new locations come brand new characters, too. Most notably, the show introduces the inhabitants of Dorne, the desert at the southern edge of Westeros that was home to last season’s MVP, the charismatic Prince Oberyn Martell, who met a grisly end at the hands of Gregor Clegane during Tyrion’s trial by combat. Oberyn’s paramour, Ellaria Sand (played to fiery perfection by Indira Varma), is the gateway into the unfamiliar kingdom, as she’s hell-bent on getting revenge on the Lannisters for her lover’s death with support from Oberyn’s three illegitimate warrior daughters, aptly nicknamed the Sand Snakes, whose brief introduction gives them an Indiana Jones-meets-Charlie’s Angels vibe. While these new characters, including Dorne’s physically weak ruler Prince Doran (Alexander Siddig) and his sworn shield Areo Hotah (DeObia Oparei), are intriguing enough, the show’s method of introducing them and Dorne itself is a little too speedy and comes off as an afterthought. The most effective new character addition so far is the High Sparrow, played by veteran Welsh actor Jonathan Pryce. The soft-spoken priest brings in a new line of religious fanaticism that’s sure to shake up the royal happenings in the capital — and give Cersei another window for wielding power. Another major arc that unfolds this season is at the Wall, as wannabe king Stannis Baratheon (Stephen Dillane) and company have taken up residence at Castle Black, serving as a rift in the Night’s Watch and Wildings saga. Dillane and Carice Van Houten, who portrays red priestess Melisandre, have never been better at embodying their characters, both of whom cause Jon Snow (Kit Harrington) a lot of trouble when it comes to keeping his vows and allegiances. Judging from an early development this season, Jon’s story has never been more absorbing than in these first four episodes. Of course, it would be a crime not to give Daenerys Targaryen (Emilia Clarke) a shout out. Those who thought the Mother of Dragons’ storyline dragged last season have no cause to worry now, as we get to see a lot more of her this season as she tries to rule successfully. She’s busy dealing with an increasingly violent threat to her regime in Meereen, while struggling to please the slaves she freed and the masters she condemned. Not to mention, she’s dealing with the consequences of locking up two of her dragons, which are more ferocious and intimidating than ever before. The largest one, Drogon, is still flying freely, and proof that Thrones’ CGI quality is worthy of being in a movie theater. Game of Thrones is at its best when it thematically ties its sprawling storylines together, and so far season five is a prime example of just that. Add in the top-notch acting and the show’s unapologetic grandeur and the verdict is in: Winter is coming in Westeros, but the new season is a breath of fresh, spring air. Season 5 of “Game of Thrones” premieres April 12 on HBO, HBO Go and HBO Now at 9 p.m. ET.